The alpha A6400 is Sony's most recent mirrorless offering. This camera boasts a 24.2MP APS-C Exmor CMOS sensor, as well as "the world's fastest autofocus" of 0.02 seconds. 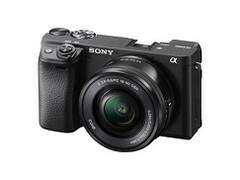 The A6400 also features a state-of-the-art BIONZ X image processor. However, its most outstanding feature may be the LCD touchscreen, which is adjustable through 180 degrees. The alpha a6400 is Sony's latest APS-C mirrorless camera. It has just been announced officially by the company, and will start becoming available for sale in February 2019. Many prosumers may be attracted to the new a6400's compact design and ground-breaking 0.02-second auto-focus acquisition capability. However, they may also be drawn to the fact that Sony finally seems to have gone with the demand for a rear-mounted touchscreen for frame-finding in this new alpha-series camera. It is an LCD panel that can be flipped outward and tilted through as much as 180 degrees. Besides this, Sony claims to have improved on real-time Eye AF, and has included real-time object-tracking, in this new model. This is done with the a6400's 24.2MP APS-C Exmor CMOS sensor. In addition to its new adjustable screen, it also shares the attribute of latest-generation BIONZ X image processing with some other high-end alpha-line cameras. The a6400 may also deliver high-speed continuous shooting at up to 11fps, although this feature requires the mechanical shutter. For silent continual image-capture, there is an 8fps setting. The a6400 also features continuous AF/AE tracking, as well as 4K recording with full pixel readout and without pixel binning. It also offers high-fps interval recording, so as to produce time-lapse video of potentially higher quality compared to conventional slow-mo settings. This model will be sold at a recommended price of US$900 as a single module. However, there will also be options to purchase it with a bundled 16-50mm F3.5–5.6 lens for an additional $100, or with a 18-135mm F3.5-5.6 lens for $400 more.